The shore crab aquarium – a perspective shift. This summer I revisited a childhood paradise, Hallands Väderö, an island on the west coast of Sweden. As a child, I used to catch small shore crabs there, and get a terrible sunburn. I’d spend six hours crouching on the shoreline, with my back to the unrelenting Scandinavian sun. No protective tan. Just very pale, sun-sensitive skin that I’ve inherited from my freckled red-headed father. Those were the days, when nobody knew about melanoma, and having a deep tan was the height of fashion. Side note: Over the years, I’ve learned to avoid sunburn (I no longer harbor any illusions of achieving a nice tan, wear sensible long-sleeve clothes, avoid direct summer sunlight between 11 and 15, and wear sun screen lotion if I can’t avoid it). But I’ve maintained that passion for catching shore crabs, or green crabs as you might know them by – they go by the latin name of Carcinus maenas. And this summer, I had my kids along, and they’ve inherited my fascination with these little critters. In case you’re wondering: this blog post is not going to be a nostalgic walk down memory lane. Rather, it’s going to be about discovering that the lane you’re walking on is no longer a place where you want to be. I’ll also encourage you to look at the lanes that you’re walking on. The habits you learned as a child, and that you’re still holding on to – but maybe it’s time to let go of. OK, let’s get back to those crabs. You lure them with bait. Stick a piece of something edible to a string, submerge it so they can access it, and when they climb onto the bait, you carefully and slowly pull them out of the water. They often jump or fall off at some point, but typically eagerly climb back on (the “climb back on” is important information, as will be discussed later). You remove their shelter. 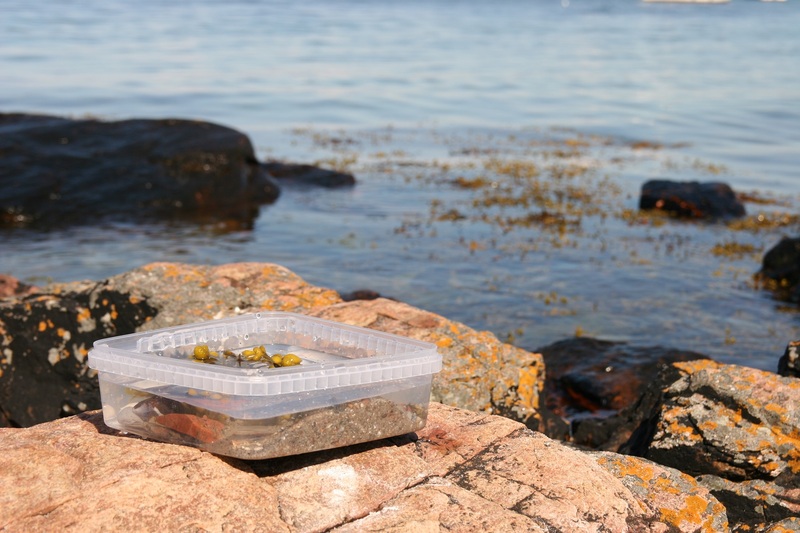 Carefully lift a number of small rocks until you happen to expose a hiding baby crab. Grab the crab before it sprints for cover or burrows in the sand, and hope you don’t get pinched. I’ll return to some ethical reflections about those techniques later. Most people go for the luring method, it’s safer (especially if you’re using a net once they’re out of the water), and the fishing is done in deeper waters so the crabs are bigger. 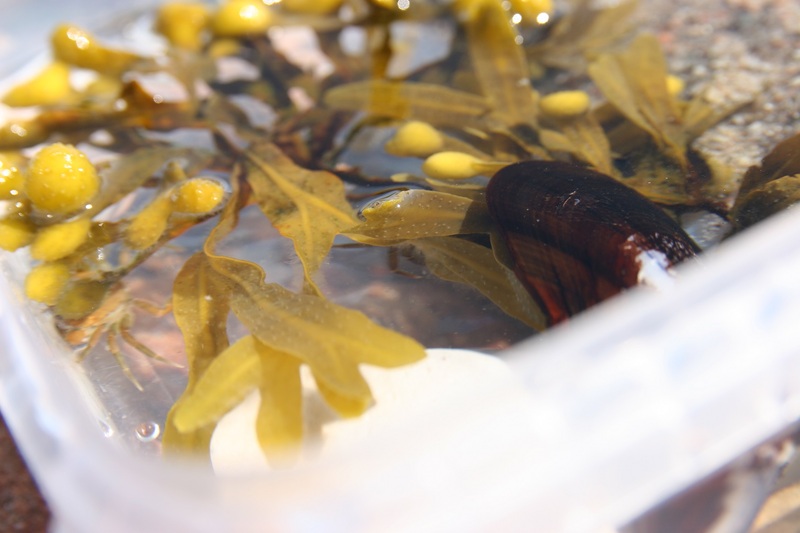 The shelter-removal method only works in less than knee-deep water (deeper than that it’s difficult to see the tiny crabs since they tend to be a lot smaller). The lure method. 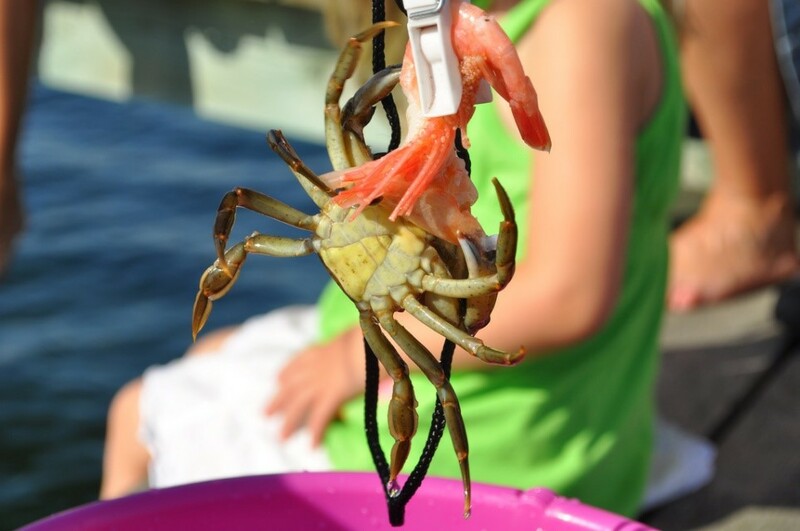 The crab has climbed onto the shrimp, been lifted out of the water and is about to be dropped into the bucket, typically containing sea water and nothing else. Once the crab is caught, most people keep them in a bucket of sea water while the fishing session lasts, and then let them back out again. They’re too small to eat, anyway. I’ve caught more crabs than I can remember. And without much thought, I’ve put them in buckets for an hour or two, sometimes piling them up in droves. Let’s take a moment to reflect on that. In my cultural upbringing, piling shore crabs in buckets for up to a few hours, is the norm. It’s a habit that’s ingrained in us, passed down through the generations. Why piling crabs in buckets of sea water now bothers me. For me, it didn’t use to be problematic. I didn’t cause them any intentional suffering, I changed their water to keep it fresh, I often fed them in the bucket, I let them out after a while. It didn’t use to bother me. But this time, I had a different experience. This time, I’ve spent the last year blogging and teaching online classes about animal behaviour management and animal welfare. Often with an ethical twist. I’ve questioned the use of dog collars, whether dogs aren’t perhaps weaned too early, and whether hyperflexion in horses should be considered abuse. I’ve argued that we should assume that animals have emotions, if only because that makes the world a better place. So, I’ve been rationally reasoning about topics related to animal wellbeing. And yet I’ve always piled live crabs in a bucket of seawater without much thought to their welfare. Actually, I carried on the legacy and have taught my kids to pile live crabs in a bucket of seawater. … can they suffer? 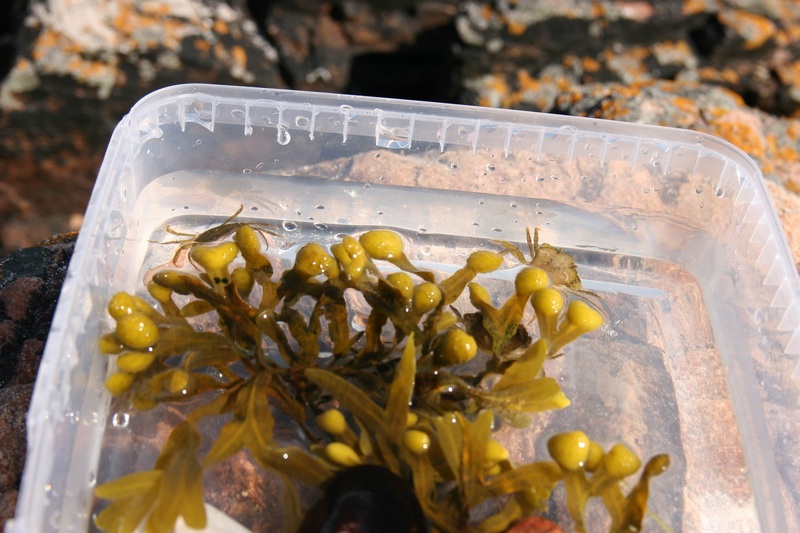 Tiny shore crabs in a container holding sea water. So what, you might think. It’s not like they’re dogs or horses. Here’s the thing. With mammals and birds, we humans tend to get emotionally involved. We care. But with regards to shore crabs, we typically don’t get the same emotional sensation of connectedness and engagement as we do with mammals or birds – there’s no limbic resonance. We might find it fascinating to watch them scuttle about, but most people don’t care, on that fundamental emotional level. Some do, for sure, but most people do not. Not the way I cared about Lodde the harbor seal that I had just met moments before this film was shot. Playing with the harbor seal Lodde at Odense Zoo, Denmark. This playful interaction involved a powerful emotional connection, at least on my part, due in part to limbic resonance. Note that Lodde initiates the movements, and I follow: giving control to animals often leads to higher engagement. So, apparently, on an emotional level, shore crab’s potential suffering, or whether they’re having a bad day, hasn’t concerned me much. But this time, I couldn’t bring myself to piling them in the bucket. There was a new, nagging concern there. A rational concern, not an emotional one – I simply don’t get that limbic connection to those tiny critters. The interesting question isn’t really whether I should develop an emotional connection with crabs. Jeremy Bentham said, sometime in the 1800ds, that the relevant ethical question is not whether animals can reason or talk, but whether they can suffer. To reinterpret that with regards to shore crabs: the relevant question isn’t whether we care, it’s whether they can suffer. On the island, when my rational mind started making objections to crab-piling, I wasn’t aware of the latest research. But it turns out that as recently as in 2005, whether crabs and their relatives could suffer was unclear to scientists. In later years, the evidence suggests that they can. 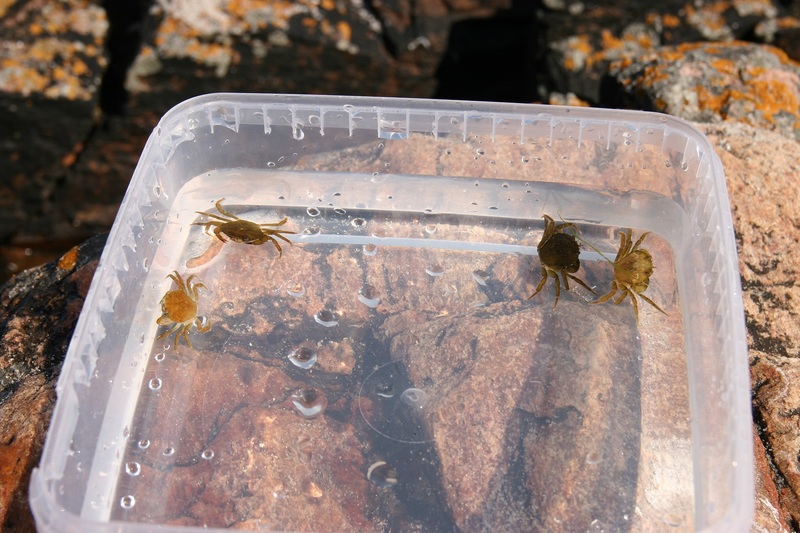 Apparently, shore crabs show avoidance learning, and they choose to expose themselves to aversive stimuli to access valuable resources – but they won’t do it to get access to resources of less value. They have a suitable nervous system for pain awareness, including opioid receptors, and respond to analgesics and local anesthetics. So, while at the island, I didn’t know about the recent scientific findings, but I had a major mind shift about how to go about crab fishing. Specifically, about how they’re kept in the bucket (or in this case, the container that we’d brought our lunch in). The container may hold sea water, but it’s pretty far removed from their natural habitat. So I decided to offer them a better option. I decided I wanted to show my kids a better option. After all, learning to empathize will shore crabs (where there’s no limbic resonance) will probably make them more caring with other animals – and other people (where there is). And thinking rationally about animal wellbeing, in addition to emotionally, is another useful exercise, for kids and adults alike. So, how do you go about creating a suitable habitat, for any animal? I talk about some key features of a good habitat, or enclosure, in my senior lecturer’s exam lecture, which you’ll find free access to here, but the principles are the same, regardless of the animal species. Step 1: added a wad of sea weed. There are three crabs in this image, by the way. Step 2: included some rocks and empty sea shells. There are two crabs in this image. Likely, you’ll find that some of the crabs climb the sea weed, some take refuge under the sea shell, and some hide under rocks. The opportunity to choose is crucial in promoting animal welfare. Finally, adding some sand allows them to burrow. In this group of four, only one of the crabs chose that option. Step 3: added some sand, and one of the crabs started burrowing. Among mammals, different species form different types of social groups. Some are solitary, others form pairs, or groups containing one or more males. Knowing natural group structure is very important in predicting which group constellations are going to get along in captivity. How about shore crabs? From what I can tell, they don’t form social clusters, unlike the clustering seen in hermit crabs. I sometimes see many crabs in a small area, but I interpret most social behaviour as aggressive or competitive. In this group of four, there was no fighting, but I’d expect that to occur above some threshold density. So, from the social perspective, I’d avoid adding too many crabs to the aquarium, and I’d be careful about adding food. Studies have shown that they fight more if food is present. Here’s the dilemma, though: feeding may on the one hand potentially be beneficial since it might serve as a type of counter conditioning procedure. On the other hand, it may exacerbate the aversiveness of the holding area if it leads to aggression over defendable resources. Feeding in several locations would probably diminish the risk of aggressive behaviour, though. This particular shore crab aquarium was short-lived, about half an hour, so thinking about time budgets (that the relative frequency of behaviours shown match what animals would do in the wild), or foraging opportunities, was not a big issue. That’s a huge concern for animals kept in human care on a permanent basis, though. That day at the island Hallands Väderö, I had the uncomfortable realization that I didn’t like how I’d been handling crabs all my life. Since then, I actually haven’t caught any; much of the allure was lost when I started thinking more about how the capture-and-holding process might impact the animal’s wellbeing. My thoughts are that the lure method gives the animal an element of choice and control which is lacking in the shelter-removal method, for instance. The fact that they typically eagerly climb back onto the bait (even in the bucket) suggests that there’s no avoidance learning going on. The take home message isn’t what you might think it is. In case you’re thinking that the main take-home message from this blog post is about how to accommodate shore crabs while teaching your kids about animal wellbeing: it’s not. It’s about how our cultural upbringing blinds us to ethical problems. It’s about how if everyone else is doing something, we don’t question it. It’s about how we engage emotionally in some types of animals (typically furry ones with big eyes and floppy ears) and not others, and it’s about the usefulness of sometimes trying to be rational in order to reassess what you’re doing to animals that you don’t engage emotionally to. This time, I took a look at my crab-fishing behaviour, and I didn’t like it. So I changed it. And I taught my kids an important lesson of empathy and rational thinking, too. Have you ever done the same, breaking with norms you grew up with, and changing how you interact with other animals? I bet you have. I think we’re all treating animals differently now than we did 10 years ago. What will you do differently 10 years from now? What are you doing now that you won’t like, and change, in the future? Do me a favour, will you? Don’t wait ten years. I know it’s uncomfortable and hard, but change today. The animals that cross your path now, and in the future, will thank you for it. I typically don’t discuss shore crabs but ponies, poodles, pigs, parrots and people. One step towards changing your behaviour and relationship with animals is understanding more about emotional states in animals and how they impact their personality, brain development, social skills and stress sensitivity. If you’re ready to take that step, you may want to check out my course about animal emotions. Enrollment is only open for a brief time every year, and if you sign up below I’ll make sure you won’t miss the announcements and free trainings. Years ago it was quite normal to train dogs with all sorts of correction tools. Corrections were in that time, one thought, needed to get a dog in the Garel/under control. 10 years ago I already found that the training methods do not fit my way, how to deal with animals. Three years ago I started to train from the dog his eyes. The welfare of the dog is more important ultimately than the result of a good listening dog. But what turned out, it takes a little longer, but the dog did exactly the same and listened just as dogs that were brought up with corrections. But… the difference is my dogs are much happier on the streets. They find it nice to come because they do that for me! I realize more and more that training is the best way of educating in a positive way. Even if it’s XXL’s Bullys or pitbulls. Yes! I think many people have made that transition – crossing over from traditional punishment- based training to training based on positive reinforcement..! …..when I started working in the aquarium world ..I was there because I WANTED to work with marine mammals….I walked into work…and sure there were lots of seals/ dolphins…but there 1000’s of fish, 100’s of birds, lots of reptiles…and other mammals I didn’t expect – and I was part of the human team responsible for all these lives. What I learned quickly…particularly when the animals were “patients”…….that every single one of them was unique…and I realised…I suddenly cared for how they felt too (little sharks, seahorses, turtles, nautilus, octupus, cuttlefish – so many new to me. When I worked to save their lives when they were sick…or tried to work out why they had “problems” behaviourally/ physiologically – and worked with them through their simple and complex journeys with us – I learned also that each animal within each species…was an individual. A gift…I try hard to share – it is not just about “me”…it’s about ensuring there are enough people who know the “magic” – to care – for all beings – not just the “obvious” ones…. Each has a voice – if we listen. A powerful gift indeed, to find that empathetic care for critters other than the furry ones! 13 years ago I had only cats. My cats were all well mannered/trained but the only method I knew at that time was negative reinforcement. “No” and spray bottles of water tended to work well with cats. Then I adopted a brother sister pair of kittens. He was content to avoid negative reinforcement and so trained easily. She, however, was one of those personalities that thrived on attention – even negative. She would walk into a room and instantly perform every active she knew would draw “punishment”. After a water spray, she would do the feline equivalent of a laugh and move on to the next thing she knew she was not supposed to do. I knew I had to find anther way since I was not willing to move to harsher punishment. I started to read training books like Karen Pryor. All these years later, I have dogs and train them in competitive obedience, nosework, etc. They are my playmates and I spend a lot of time working with them. That decision to change my direction and do something different than what I grew up with has actually changed my life. Thanks for sharing your story! I think many share similar experiences, transitioning from traditional training into the positive reinforcement world. Next PostNext Do we need to redefine “training” – or “behaviour”? Or both?